Natural wool is white in color with a slight brown hue, Berber black and white carpet is a specificity of Berber weaving. Hand-woven directly from this untreated wool, it forms the basis of weaving, it is also the trademark of some Berber tribes, such as Beni Ouarain or Mrirt. You will find below a set of Berber carpets black and white or plain white, sometimes other colors can be found there. 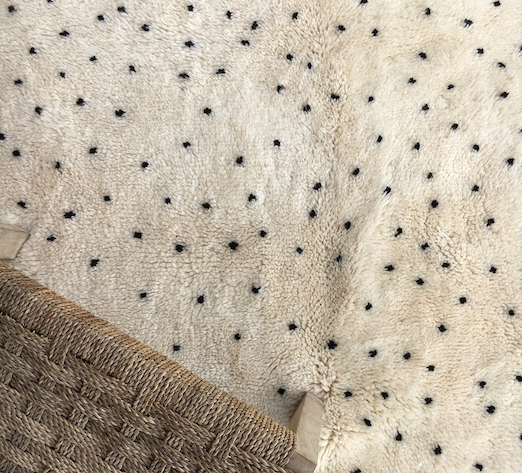 The most common classic pattern is that of Berber black and white carpets, which is the trademark of Berber craftsmanship, often this off-white can also be closer to beige.